Swachh Bharat Cess is an additional levy of 0.50% on all the taxable services with effect from 15th November, 2015. This Swachh Bharat Cess will be added in the service tax rate which makes effective service tax rate of 14.50% and all the taxable services which will be provided on or after 15th November, 2015, will be chargeable with new service tax of 14.50% including Swachh Bharat Cess. This additional levy translates into tax of 50 paise on every hundred rupees worth of taxable services. Let?s understand Swachh Bharat Cess in detail. Budgeted Expenditure on health in India is around Rs.6,700 crore annually which translates into approximate Rs.55 per capita. With Swachh Bharat Cess, Central Government aims to involve each and every citizen of India towards making India Clean and healthy. The tax collected from Swachh Bharat Cess will be extensively used for financing and promoting Swachh Bharat initiatives or for any other purposes relating to Swachh Bharat such as building toilets. Swachh Bharat Cess (SBC) was initially proposed to be at 2 percent on the value of taxable services in the Budget 2015 but the rate has been reduced to 0.50% vide Notification No.22/2015-ST dated 6th November, 2015. Swachh Bharat Cess will be levied only on the taxable services i.e. not on exempted services and non-taxable services aka in negative list. Further, the manner of calculation of Swachh Bharat Cess will be same as of service tax i.e. if abatement is there for any services under service tax act, than the same rule shall be applicable for calculating Swachh Bharat Cess. For example restaurants or eating joints having air-conditioning facility enjoys abatement of service tax of 60% i.e. service tax is levied only 5.60% (40% of 14%). Thus the same principle goes with Swachh Bharat Cess and the additional levy will be 0.20% (40% of 0.50%) which makes the effective service tax rate of 5.80%. Similarly in case of reverse charge mechanism, the person liable to pay service tax is also liable to pay Swachh Bharat Cess and?is case of Goods Transport Agency (GTA) which pays service tax at abated rate of 4.2% (30% of 14%), Swachh Bharat Cess will also be payable at abated rate of 0.15% (30% of 0.50%), making effective rate of service tax of 4.35%. Thus, it is very clear that all the provisions of service tax as contained in Chapter V of the Finance Act, 1994 including those related to computation of taxable value, assessment, exemption, payment, penalty applicable to service tax would also apply in respect of Swachh Bharat Cess. Swachh Bharat Cess is an additional levy and is required to be added in the invoice separately. It should not be clubbed with service tax. However, one can take input credit of the Swachh Bharat Cess paid similar to service tax. For example: Restaurant Bill assuming having air-conditioning facility. In case where payment has been received and invoice is raised before the service becomes taxable, i.e., prior to 15th November, 2015. In case payment has been received before the service became taxable i.e. before 15th November, 2015 and invoice is raised within 14 days of imposition of new service tax including Swachh Bharat Cess, i.e. upto 29th November, 2015. I don?t understand the contention of Government in imposing SBC. On the one hand Government is trying to pass GST bill which will eliminate all the indirect taxes including service tax, VAT, sales tax, excise duty and on the other hand Government has increased the rate of service tax from 12.36% to 14% as well as levied additional tax of 0.50% in form of Swachh Bharat Cess making things complicated for common man. Do you support this additional levy of 0.50% Swachh Bharat Cess? Please share your views in the comment box below. I love to write articles on Taxation, Financial Planning, Investment and reviews on IPO and Insurance Schemes, financial services and products. Why you should take a home loan when you buy a property? Hi sir, I am subramanyam, Our Company Receiving Ware House Rent , we are preparing Invoice for rent period 01.11.2015 to 30.11.2015 and Invoice Dt.01.12.2015. Now how much tax we have to pay. i wana know that how you started your blog. Whats the inspiration behind this.And what is the procedure to start ones own blog. I have a doubt for payment of SBC Tax. This is the way right or not? Above it is mentioned that ITC for the Swach Bharat Cess(SBC) is available, but that is not true. SBC is not integrated in the Cenvat Credit Chain. Therefore, credit of SBC cannot be availed. Further, SBC cannot be paid by utilizing credit of any other duty or tax. It has to be paid in cash. 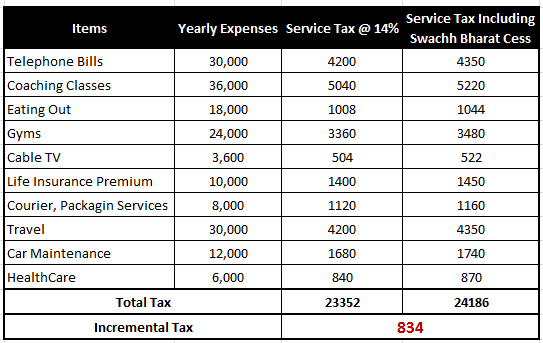 in Computation of Service Tax ST3 how to see in Tally ST3 are generate but if swachh bharat cess we accounting under service tax haed it will automatic count 14 % means total 28% (14+14) & in ST3 shown the same but if we account Swachh bhart cess under swach bharat cess then it will calculate @0.50% but will not appear in ST3 total payable service tax exluding Swachh Bharat cess which is wrong please reply me in ST3 how it will appear & how to accounting the same. It is burden for common people. If Govt wants SB Cess they take from big big richest people, those who do not pay tax catch them. Actually common people paying taxes properly same way if all richest people pay taxes properly Govt should not do all these things additionally. All politicians are making Millions money illegally without doing anything. One Word we can say this extra SB Cess is burden for Middle Class people. I received a a text from my internet provider today – Dec 1st 2015 saying that ?Swatch Bharat cess of 0.50% will be levied on all bills generated on or after 15 Nov 2015? . Why did they inform me so late…. . This is ridiculous. How much tax we – The common- people have to pay ??? and even we are not getting appropriate services despite of paying such a high tax. IF A SERVICE PROVIDER RAISED INVOICE ON 13/11/15 AND PAYMENT RECEIVED ON 15/01/16, HOW CAN HE PAY THE SERVICE TAX WITH SBC ON 6/1/15. THE SERVICE PROVIDER MAY NOT HAVING THAT MUCH CONTROL. IT IS BETTER TO AMMEND THAT THERE SHOULD NOT BE LEVIED THE SBC IF THE SERVICE PROVIDER COMPLETED HIS SERVICE ON 10/11/15 AND INVOICE RAISED ON 13/11/15 AND PAYMENT RECEIVED ON 10/1/15. THERE SHOULD NOT BE SBC LIABILITY. Already we have many taxes levied on us. This is additional. Because of this, the prices of all services will go up, which are already high. Everything will become more expensive. The 2nd thing, if we agree for this, the SBC amount should be utilized properly for relevant purpose. At a point of time when a uniform GST is in process & all existing cess or levies subsumed under one common levy across goods & services, what is the need for this new confusion? can the govt ever bring out a simple, uncomplicated, assessee friendly tax soluation ?